Netflix uses its social media accounts to poke fun at themselves as well as others and they've now taken aim at the latest trailer for Sony's Venom in a hilarious Farmers Insurance spoof. The Tom Hardy-starring project has seen its fair share of trolling ever since the first footage was released earlier this year. We've seen some famous actors compare the character's tongue to another part of the male body and there's also a version of the new trailer that gives the symbiote some eyes. But Netflix has posted a pretty clever Venom and famous insurance commercial mashup and it wins the fictional contest for best Venom troll thus far. In addition to seeing Riot in the new Venom trailer and even more of the main symbiote, comic book fans were excited to see the return of the famous catchphrase, "We are Venom." However, it was only a matter of time before the popular phrase got a proper trolling. Netflix's NX account, which is apparently a space for fantasy and anything sci-fi, posted a funny mashup video between the Venom trailer's catchphrase from the comics and mixed it with the popular Farmers' Insurance commercials: "We are Venom... Bum Badum BumBumBumBum." In addition, the NX account also took the Venom image and morphed it into the color scheme and logo of Farmers' Insurance. It's by far one of the best parodies of the Venom movie, and there's still a few weeks before the movie even hits theaters. Obviously, Netflix is just having some fun with the upcoming Sony/Marvel movie, but they may have inadvertently hooked the project up with a new corporate sponsorship. 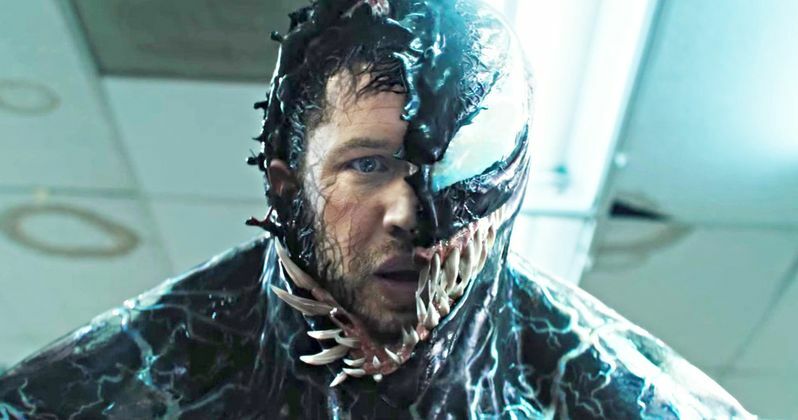 The Venom promotional campaign has had its ups and downs over the last handful of months, but the latest trailer is certainly a major upswing for the film. Knowing that Riz Ahmed's Dr. Carlton Drake of the Life Foundation gets into the symbiote mix with Riot adds a whole other level of intrigue for the movie, which wasn't present before. Previous bits of promotional material were criticized for not showing enough of Venom, but that's all forgotten now, as most comic book fans who were once skeptical of Venom are now hyped to see the movie. Venom hits theaters on October 5th, which is just around the corner and fans are hoping that we get to see Carnage on the big screen as well. It has been heavily rumored that Woody Harrelson is taking on the role of Cletus Kasady, aka Carnage, but there has been no official confirmation. Harrelson has confirmed that he is in the movie, and that it's a small part that will be made into something bigger for the sequel. So, if Carnage does show up in Venom, it will likely be just a tease, so let's hope that the sequel ends up getting made. While we wait to learn about Carnage, you can check out the Farmers' Insurance/Venom mashup below, thanks to the NX Twitter account.